Use CAD4PLT to print all drawings of one or more Inventor assemblies directly from Autodesk® Vault® and / or export them as PDFs. Opening and customizing the title blocks of individual drawings, as well as sorting the printed drawings, is not only annoying, but also takes a lot of time, especially if you need to print an entire project. CAD4PLT offers you a central point for this purpose. Print all the drawings of an entire project in a fraction of the usual time with just a few clicks. In Autodesk Vault, select the assembly or part that you want to print. CAD4PLT lists all related drawings of the assembly and its components hierarchically. Conveniently, you can specify what, how, where, in what order, and in what sheet format to print or export. You can also add additional components and assemblies. This allows you to create multiple documents in just one step. You can specify the target printer and sheet format for all documents, individual assemblies, or for each sheet of a drawing. Choose which documents should be printed and which should not. CAD4PLT ensures that every drawing is printed as you like it. Print and export PDF documents in just one session. It is up to you to print or export a drawing. You can also do both within the same print job. Of course, you can also specify how a document is exported. You have also the choice of exporting all documents to a central location or to the respective folder of the associated drawing. All documents are listed hierarchically and sorted by BOM in the Plot Manager. Sort your documents with Drag and Drop. This allows you to recompose and move individual sheets as well as entire assemblies in the print job. Use CAD4PLT to avoid tedious and time-consuming sheet sorting after printing! The Plot Manager not only gives you the ability to manage your drawings, it also shows you all relevant file information. Default sheet size, sheet name, and thumbnails are default information. However, you can extend the view to display more properties from within the Autodesk Vault. For example, you can display the last editor or show the editing status of the files. With the print commission, you can quickly and easily place your texts in the drawing heads for the entire print job. This is also possible with released documents. It is important that the fields are created as iProperties and mapped with Autodesk Vault. Use this feature to transfer project information or production-related data, such as barcodes, to the entire set of documents without the need for a separate file check-out. Print jobs can be easily saved and loaded. This allows you to retrieve your documents at a later date and print them out with the same settings and in the same order. Archive or share your print jobs with your colleagues using a network drive. CAD4PLT can be tested for 30 days. You can then order a subscription through the App store. A new installation is not required after the trial has expired. Furthermore, you also have the opportunity to purchase the software directly through our company. If you do so, you will receive a new setup. 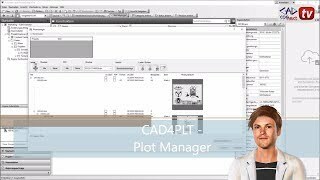 Changed menu button name from "Plot Manager" to "CAD4PLT - Plot Manager"